Estimating and ranking are very important parts of the Scrum framework. And Planning Poker is an essential tool in the estimation and ranking processes. 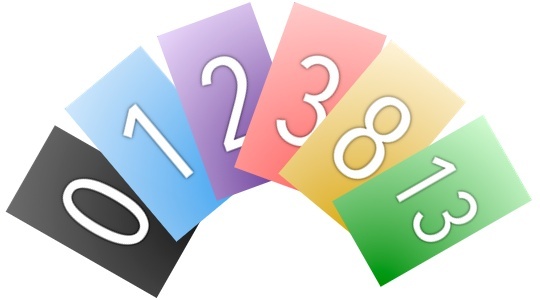 Here are some quick tips and guidelines on estimating in Story Points with Planning Poker. This comes right out of the official Scrum framework. This blog post is only intended to be a quick reference for someone already trained and skilled in Scrum. For all the details on the process, every team member should read this book from Mark Layton called Agile Project Management For Dummies - see my review here. You'll use these techniques many times throughout your project. Rank all stories when planning the Product Backlog. Estimate all stories, based on the order they are ranked, when planning the Product Backlog. You could break the Product Backlog into multiple estimating sessions, based on the order they are ranked. Review estimates again at every Sprint in Sprint Planning. The Baseline Story is used to compare all other stories against, when you are estimating. It provides a common understanding for the team, on which they can base the rest of their estimates. The team selects the simplest story, and estimates it's Story Points using Planning Poker. 1 story should be able to be completed by 1 team member within 1 Sprint. If not, the story must be broken down further. What is Planning Poker ? A relative estimation technique - Based on Fibonacci number sequence. Done by the team members who will do the work. Enables more accurate long-term planning. Each team member selects a card from their card deck - Don't show it yet. The Product Owner provides additional information, as necessary. The team iterates the process, usually up to 3 times, until consensus is reached. This card deck is in PDF format and is formatted to display well on an iPhone 5 screen, but of course will work fine in any PDF viewer app on any device. The card deck includes numbers from 0 to 89, based on the Fibonacci sequence, and also includes a question mark card. The cards are colored coded in a rainbow sequence to make them easier to quickly identify. Below are links to the PDF files. I've got 2 versions. The links to the PDFs will open them in Google Drive viewer. To download the PDF file, click the Download icon. Planning Poker Cards Solid Background.pdf - This is simple, but small (509K) and it renders fast. Planning Poker Cards Gradient Background.pdf - This one is a bit prettier with a gradient background, but it's larger (1,832K) and it renders slower. The easiest way to use this card deck in a way that simulates real paper cards is to view it on a smartphone. You can flip through your cards on your phone to the one you want, and everyone can show their card at the same time, right on their phone. Sync, download or email the PDF to your smartphone. Open it in a PDF viewer, that supports Single Page viewing (versus continuous) - Acrobat Reader on iOS works great. Single Page viewing mode will allow you to find the card you want quickly by swiping smoothly through the cards with your finger. Swipe to the card you want to use. I agree with you. By following the principles of Scrum, continuous improvement with consistent testing of quality can increase the chances of attaining the anticipated levels of quality in a Scrum project. Regular interaction between the stakeholders which includes users and customers and Scrum Core team can decrease the gap regarding the expectations and actual deliverables of the product by valuable suggestions at the end of each Sprint.